See you at Formnext 2018! Home → 3D Printers → See you at Formnext 2018! Come and visit us at formnext 2018! Robot Factory will participate to the Formnext, the world’s largest trade show dedicated to 3D printing technologies, that will take place from 13th to 16th, November 2018, in Frankfurt (Germany). With some 550 stands expected to be in operation during the event, this edition is likely to attract well in excess of 20.000 attendees…never before so many innovative technologies have been available, so many companies are eager to take advantage of these new opportunities. Do you wish to get a “free entry voucher” for the exhibition days? Send us a short email at robot@robotfactory.it, and we will send you an entry voucher. 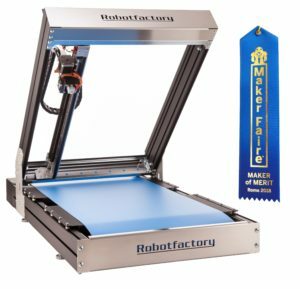 At the leading international exhibition for additive manufacturing, Robot Factory will take part and present the Sliding-3D, the brand-new 3D printer (FDM), equipped with an “infinite” build platform and 45° extruder. Sliding-3D redefines the concept of 3D printing, because it is a high-quality product intended to support companies both in the development process and in the production… allowing to significantly reduce the time-to-market. So, it become a valuable tool, not only in the development phases of a new object, but also in the production of small series or unique pieces. Sliding-3D simplifies the production of small series, as well as the 3D printing of extremely long objects, because the distinguishing feature of Sliding-3D is the build volume: 410 mm x 38 mm x ∞ (endless). Its printing platform is a moving belt, this means it can be engaged in an “uninterrupted” work cycle. This makes Sliding-3D particularly suitable both for serial production of small items as well as for 3D printing of large objects.